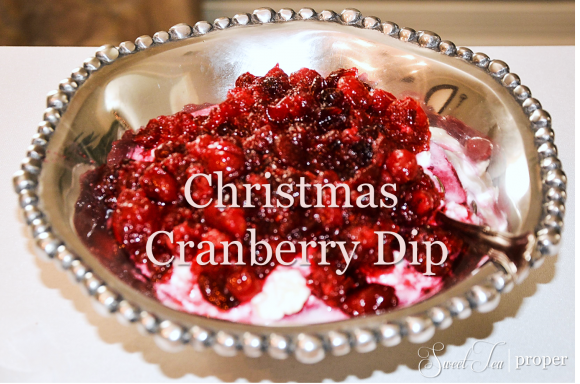 The first time I saw a recipe for Christmas cranberry dip, I thought, “Ooh! This looks good,” but I knew immediately that I’d prefer it with adjustments. As with pepper jelly, this dip is made, chilled, and served over a block of cream cheese with crackers. Since I would be using this recipe for a party (where pepper jelly over cream cheese would likely be served), I wanted to make this recipe just sweet, rather than sweet and salty. Using only five ingredients, plus graham crackers for dipping, this recipe couldn’t be easier. It was a hit at both holiday parties and since it is made a day in advance, it gives you plenty of time to get ready without having to worry about another dish to keep warm. Pour cranberries, sugar, and orange juice into a saucepan over low heat, stirring occasionally. Once the sugar dissolves, increase the heat to medium, continuing to stir every few minutes. Once all of the cranberries have burst (about 10 – 15 minutes), remove from heat. Allow cranberry sauce to cool down before transferring it to a container with a lid. Refrigerate a minimum of 4 – 6 hours, but preferably overnight. This allows everything to settle and the sugar to set, which will sweeten the cranberry sauce. Place the block of cream cheese in a large bowl. Pour in the pineapple with the juices. Blend together completely. *STP Tip: This is easiest to do with your hands. If you’d prefer to blend it with a spoon or mixer, make sure the cream cheese has softened first. Cover and refrigerate cream cheese mixture 4 – 6 hours, preferably overnight. This will thicken the cream cheese. Once chilled and ready to serve, layer the cream cheese mixture on the bottom and top with the cranberry sauce. Serve with graham crackers.